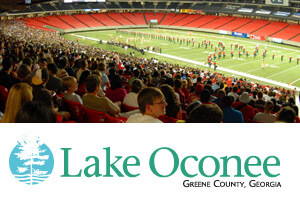 For the second year in a row, the DCI Atlanta Southeastern Championship will be sponsored by Lake Oconee & Greene County, GA. The event, featuring all 23 World Class corps, will be one of the last major competitions on the Drum Corps International Tour schedule before corps hit the home stretch to the 2010 World Championships in Indianapolis. As a returning partner, Lake Oconee & Greene County, GA are making waves and splashing up all kinds of exciting news about their premier golf courses and lake resorts–perfect as a vacation spot near a renowned DCI event. The DCI Atlanta Southeastern Championship presented by Lake Oconee & Greene County, GA will be the fifth anniversary of Marching Music's Major League at the famed Georgia Dome. The first corps will step off on Saturday, July 21 at 3 p.m. ET. Lake Oconee, a destination resort, is located halfway between Atlanta and Augusta, in beautiful Greene County. It features swimming, camping, boating, fishing, waterskiing, and more. "Partnering with Drum Corps International offers Greene County Tourism the opportunity to market our destination to thousands of families that participate in or attend Drum Corps International competitions across the country," said Tamie Moran, chairperson of Lake Oconee & Greene County Tourism. "It is a pleasure to be able to support such a well-renowned organization with dedicated performers, parents and fans." At the Southeastern Championship event, fans will be able to check out summer overnight packages as well as general information about Lake Oconee and Greene County, one of the most historic counties in the United States. "Several drum corps fans make vacation plans around the cities they visit for many of the long awaited DCI Summer Tour events," said John DeNovi, business development director for Drum Corps International. "It is great to know individuals and families have relaxing destinations like Lake Oconee and Greene County to add even more value to their drum corps travels." Offering visitors locally owned boutiques, ranging from Georgia Made Georgia Grown products, to arts, antiques, clothing and jewelry, Greene County also boasts award winning resort communities, golfing and dining. Learn more about Lake Oconee & Greene County, GA. Purchase tickets to the DCI Atlanta Southeastern Championship. About Lake Oconee and Greene County, Georgia Greene County is located half way between Atlanta and Augusta, Georgia in the beautiful piedmont region of Georgia featuring rolling hills, lush woodlands and Lake Oconee. Lake Oconee is the second largest lake in Georgia. With its 374 miles of shoreline, it offers extensive opportunities to enjoy water sports and some of the best bass fishing in the Southeast. The county is also rich in history, being formed as a frontier town in the late 1700's. Redlands Natural Forest provides opportunities for hunting, hiking and camping. Lake Oconee boasts 117 holes of golf, with courses designed by Tom Fazio, Bobb Cupp, Rees Jones, Tom Weiskopf and Jay Morrish. Accommodations include unparalleled resort lodging hosted by The Ritz-Carlton Lodge, Reynolds Plantation as well as Reynolds Plantation and Harbor Club cottages. Vacation rentals are also available for both long and short-term rental. Be sure to visit beautiful Lake Oconee just an hour away from Atlanta. More information is available at www.VisitLakeOconee.com.